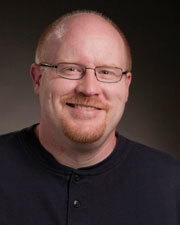 Jim is Assistant Director of Theatre for the Department of Theatre & Dance. Among his many responsibilities are supervision of the production office, box office and front-of-house for all University Theatre productions. He has also directed the University Theatre productions of Reckless (2015) and Pefect Arrangement (2018). Jim was a resident director with Central Iowa Repertory Theatre where he directed productions of The Split Infinity and Twyla’s Boy. His other credits include work as an assistant director and technical director with such companies as StageWest, the Des Moines Playhouse, Tallgrass Theatre, and the Iowa Shakespeare Project.